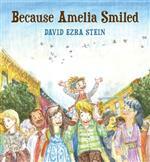 Because Amelia Smiled by David Ezra Stein. *Because Amelia smiles as she skips down the street, her neighbor Mrs. Higgins smiles too, and decides to send a care package of cookies to her grandson Lionel in Mexico. The cookies give Lionel an idea, and his idea inspires a student, who in turn inspires a ballet troupe in England! And so the good feelings that started with Amelia’s smile make their way around the world, from a goodwill recital in Israel, to an impromptu rumba concert in Paris, to a long-awaited marriage proposal in Italy, to a knitted scarf for a beloved niece back in New York. Putting a unique spin on “what goes around comes around,” David Ezra Stein’s charmingly illustrated story reminds us that adding even a small dose of kindness into the world is sure to spur more and more kindness, which could eventually make its way back to you! *A fun, fresh animal journey!Pack your bags and put on your travelin’ shoes! There’s an animal adventure waiting for you! Awake with the HOWLER MONKEYS, twist into a pretzel like a QUETZAL, hang with a SLOTH, be will-nilly like a CHINCHILLA. Squawk with an AUK, bump your rump like a CAMEL, be silly with a BILBY, and drift off to sleep in the deep of the OUTBACK. 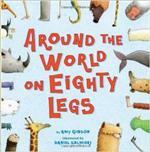 Fun-filled and fact-packed, AROUND THE WORLD ON EIGHTY LEGS is the ticket for an unforgettable adventure! *Plastic bags are cheap and easy to use. But what happens when a bag breaks or is no longer needed? In Njau, Gambia, people simply dropped the bags and went on their way. One plastic bag became two. Then ten. Then a hundred. The bags accumulated in ugly heaps alongside roads. Water pooled in them, bringing mosquitoes and disease. Some bags were burned, leaving behind a terrible smell. Some were buried, but they strangled gardens. They killed livestock that tried to eat them. Something had to change. Isatou Ceesay was that change. She found a way to recycle the bags and transform her community. This inspirational true story shows how one person’s actions really can make a difference in our world. 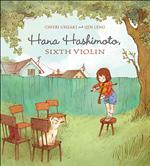 In this beautifully written picture book, Hana *Hashimoto has signed up to play her violin at her school’s talent show. The trouble is, she’s only a beginner, and she’s had only three lessons. Her brothers insist she isn’t good enough. “It’s a talent show, Hana,” they tell her. “You’ll be a disaster!” Hana remembers how wonderfully her talented grandfather, or Ojiichan, played his violin when she was visiting him in Japan. So, just like Ojiichan, Hana practices every day. She is determined to play her best. When Hana’s confidence wavers on the night of the show, however, she begins to wonder if her brothers were right. But then Hana surprises everyone once it’s her turn to perform — even herself! The Asian American female protagonist in this story offers a unique perspective, and bestselling author Chieri Uegaki has woven in lyrical scenes from Japan that add depth and resonance. The details in the artwork by Qin Leng connect the two places and contain a feeling of melody throughout. In the classroom, this book could serve as a celebration of music and performing arts, multicultural studies or the importance of intergenerational relationships. It is also a fabulous character education tie-in for discussing courage and perseverance. This terrifically inspiring book offers hope and confidence to all children who are yearning to master something difficult. Perhaps even more important, it allows children to see that there is more than one way to be successful at a task.